President Museveni shaking hands with Hon. Kyagulanyi Robert aka Bobi Wine at the late Ssebaana's funeral. 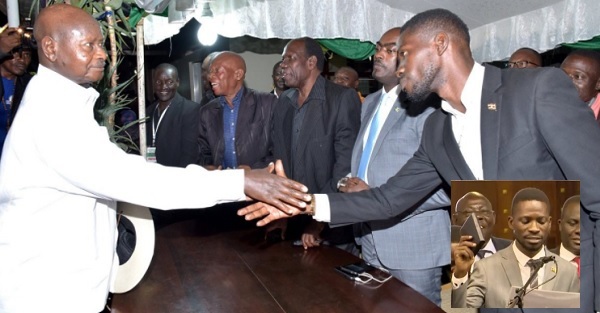 Using his Facebook timeline, President Museveni was concerned that the media was concentrating on the few NRM loses and ignoring the many wins, he also congratulated Bobi Wine. "When the NRM wins the by-elections, the Press, including the New Vision, are not happy. They do not talk about the victories. It is when the NRM loses that the Press is happy. The radios, the newspapers devote alot of space and time. This is not correct. The Press should be balanced. Otherwise, they will become part of the problem and not part of the solution. The Press also misleads the people, especially the youth. After the Kyadondo by-election, for instance, the news-papers at least, spent alot of space and time talking about the youth but in a defective and confusing way. Yes, the youth in Uganda today are 78% of the population, thanks to the Uganda families who are not lazy to have babies and the NRM that has improved some aspects of the health services and created security for those children, including the street children, to grow up, the social-economic problems they face notwithstanding. It is to the credit of the NRM that our slum-dweller children can today even make it to Parliament because those avenues are there." Mr. President, I have read your article dated 10th July, 2017 on the recent by-elections. I thank you for congratulating me on my victory in the Kyadondo East polls. For emphasis, it is not me who won, but rather the ideas which I presented to the electorate. This is why we have been saying that the government is not in touch with the people who they claim to work for. For example, every day I interact with those ‘slum dweller’ youth you talk about. (I prefer to call them GHETTO YOUTH). Despite lack of advanced education for most of them, these are people with great ideas. They have ideas for innovation and transformation. They have a proper ideology! But they have been left out completely. No one listens to them. In supporting me massively, those people were just yearning for a microphone (obwogelero/obugambiro) so that they could also be heard. They could no longer afford to see government only through its officials who drive through the ghetto in their expensive, guarded vehicles with tinted glasses, moreover paid for by taxpayers. They need a leadership which works for them. I join most Ugandans to request that you stick to your promise and not tamper with the Constitution to remove the age-limit provision for presidency. The country will be grateful for your service when you retire peacefully and let a new breed of leaders with generation-relevant skills and ideas take charge of the affairs of our motherland. I might understand that your frustration with the generation is born out of the nature of leaders you mostly interact with. Our society is unfortunately dominated by two kinds of leaders. The first category is the hardliners whose stance is that everything about Uganda is wrong. I do not subscribe to that notion, because in seeking a way forward for a better country, we must be willing to talk to each other, being aware that all of us have our failings. The other category are those leaders who come to you only for monetary favours, whether they belong to the ruling NRM or the opposition. As a result, many politicians are viewed as buyable and unprincipled. Uganda today does not need these two kinds of leaders. It simply needs principled leaders who engage with respect for each other and only for the good of the country and not for their own benefit. There are very many such Ugandans. We should only give them the opportunity. As it has been put before, it’s time to focus not on the NEXT GENERAL-ELECTION but rather on the NEXT GENERATION. Barbie and her husband Hon. 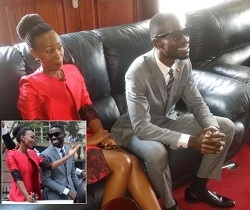 Kyagulanyi Ssentamu as he waited to be sworn in Parliament of Uganda in Kampala.